Currently we are offering the below deal - Buy 3 get 1 free on all Social Media sized digital file purchases. Simply purchase any 3 social media sized images and get one free. Visit www.photoshopmtbuller.com.au and use the code: GETSOCIAL at the checkout. 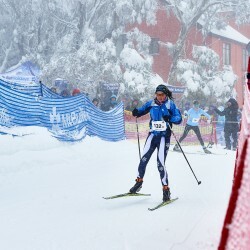 Due to dramatically increasing wind speed forecasts for Mt Buller on Sunday the 5th of August the 2018 Subaru Victorian Interschools Cross Country Championships will be held on the Village Canyons course. Please see the revised event schedule. Training will commence at 7.30am. Northside Express and Mercedes Benz chairlifts will not open at 7am as previously published due to the event site change. Village shuttle buses from the Northside day car park will be operating from 7am. Tents can be set up in the tree area between the lodges from 6am tomorrow morning. Please take absolute care to not be in a roof snow shedding zone. Resort Access: Please be advised that if you are staying off mountain and will be making day trips on the Saturday training and Sunday event day you are strongly advised to pre purchase your resort entry pass at $44 per day rather than $55 on arrival. All day trip visitors are advised to arrive well before 10am to minimise the chance of delays. Cross Country Course Location: Tirol Flat Start/Finish area adjacent to Tirol Restaurant and top of The Fox Chairlift. Training: The Cross Country Course will be open for training from Saturday morning the 4th of August. Event: The 2018 Subaru Victorian Interschools Cross Country Championships will be conducted on Sunday the 5th of August. Course Layout: The course will be designed to incorporate flat, uphill and downhill sections in the 1km loop. 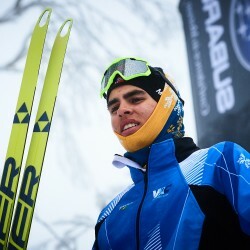 The Cross Country Technical Delegate will be involved in the final course design and layout. Access to Cross Country Course: From Day Car Park- use Northside Express Chairlift; then follow trail toward village under The Fox Chair lift, then turn uphill to right and follow signs to Cross Country course. From Village- make your way to Arlberg, either by Blue Bullet Chairlift to get to Arlberg and walk up to the course from there. Please note that only skis and day packs can be carried on the Free Shuttle Bus (no overnight luggage). 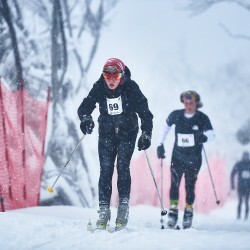 In addition those with skis on can take the Abom Express lift and ski down Baldy under the lift line approximately 500m and follow signs to the Cross Country course. Day Car Park and Village shuttle bus schedule: The Horse Hill Car Park shuttle Buses and Village Shuttle buses will run from 7am until 7pm on Saturday and Sunday the 4th and 5th of August. Event entry closure date: The event entries for the Cross Country Championships will close Monday July 23rd. Lift tickets: All Competitor and Team Manager lift tickets may be prepurchased via the online entry system by the event entry closure date of July 23 or can be purchased from 7am on the morning of the 5th of August at the Horse Hill (Day Car Park) and Saleyards (Bottom of Blue Bullet in the village) ticket offices. Payments for event entry and any required lift tickets are due by Friday July 27. Lifts covered by the XC lift tickets are Blue Bullet, Northside Express and Mercedes Benz. Competitors and Team Managers using these lifts must have skis on. No foot passengers are permitted on Blue Bullet or Mercedes Benz. Bib and prepurchased lift ticket collection: All prepurchased lift tickets and bibs will be available for pick up by an official school representative from 3pm to 6pm on Saturday the 4th of August at the Event office at Alpine Central (resort management building). For schools that order 2 day lift tickets please contact the event management team to arrange ticket and bib collection time. Bib and prepurchased lift ticket collection on Sunday will take place from 7am at the Event office at Alpine Central (resort managment building). 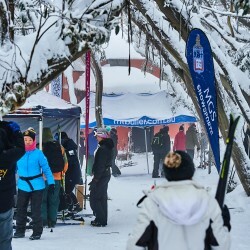 Schools wishing to pick up lift passes and bibs from the Day Car Park at Northside Express must via their school coordinator make an official request to the Event Manager David Speirs by email on info@vicinterschools.com.au. 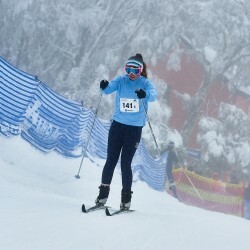 Sightseer tickets: Multiple ride footpassenger sightseer lift passes for the Cross Country event will be available from the Horse Hill lift ticket office from 7-9am on the morning of the 5th of August at a cost of $13. Please note that foot passengers are only permitted on the Northside Express lift. Schools are reminded of the new waxing rule for this years Victorian Interschools Championships. The rule is designed to encourage a level playing field for competition and aligns with an initiative being adopted by SSA’s National Cross Country Committee for all club and state level Cross Country races. While the rule will be based on an honour system and peer group review, Event Organisers reserve the right to inspect or test waxing practices in the interest of fairness. The Victorian Interschools Committee has every confidence that participating schools and competitors will respect this new rule. The specific rule is set out below.